with this Summery Ribbon Wreath. Cute right? But I realized when I was walking up to the door this weekend that something was missing. I stood there and looked at the door and then it dawned on me. I forgot the pop of blue. How I forgot that color is beyond me but I set out to rectify it immediately. So here is what I came up with using a couple wood cut outs from Hobby Lobby, some craft paint, a little wood glue and some wire. Ta da! I love it! Do you have 4th of July deco going on in your house? It is time for one of my favorite parties - Mood Board Monday with Sarah at Pewter + Sage. So this time we got to pick between some gorgeous bedding that Sarah selected. After looking at the choices - I knew I had to do a room with the beautiful Serafina Floral Duvet Cover and Sham from Pottery Barn. So this is what I came up with - check it out! Let's break this down shall we? For starters - I wanted to do a cool blue on the walls to play off the bright playful colors in the bedding. The paint shade is Windmill Wings from Benjamin Moore. I also added a cool blue quilt to the bed as well. Next, I added a wrought iron black bed from Ikea. Something about the bedding just screamed that it would be so classic with that sort of bedframe! Some more black furniture and a large mirror (all from Ikea) grounds the room and keeps the playfulness in the accessories. I flanked the 8-drawer black dresser with two silver lanterns and put a bright vase with a single bud on the nightstand (also from where? Ikea of course!). Instead of a table lamp, I wanted to use wall sconces and I would duplicate that look on each side of the bed. Finally, I added a chaise (you all know how I love chaises) with a pretty pillow and throw. For the floor, a neutral sisal rug adds a little texture. Last but not least, a large 40x40 canvas of a red flower and the room is complete. See below for a full breakdown on the items. IKEA Turkey - MAPA Mobilya ve Aksesuar Pazarlama A.Ş. So what do you think? I think this would make a fantastic guest room or even a wonderful master. Head on over to Sarah's to check out the rest of the entries! 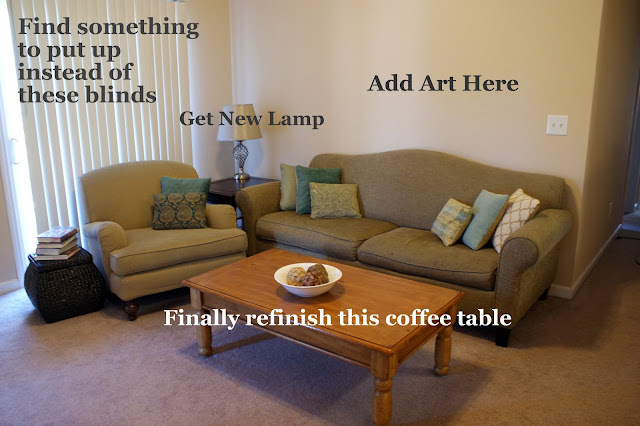 So if you saw my to-do list yesterday, one of the things on my list for the living room is a new lamp. I am very picky about lamps for some reason and I have been having a hard time picking anything out. 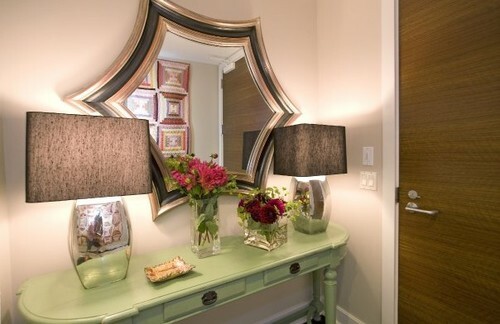 So I decided I would look on Houzz.com - my favorite inspiration site to see if I could find some lamp looks that I like. Here is what I have come up with! I think my biggest issue with lamps is that the base and the shade must be proportional. 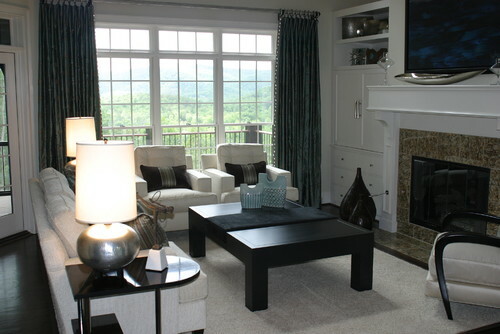 For example - here while the base is very decorative the overall lamp and shade are in proportion with one another. I really like the sleekness of these two lamps and the height is right for what I am looking for in a lamp. 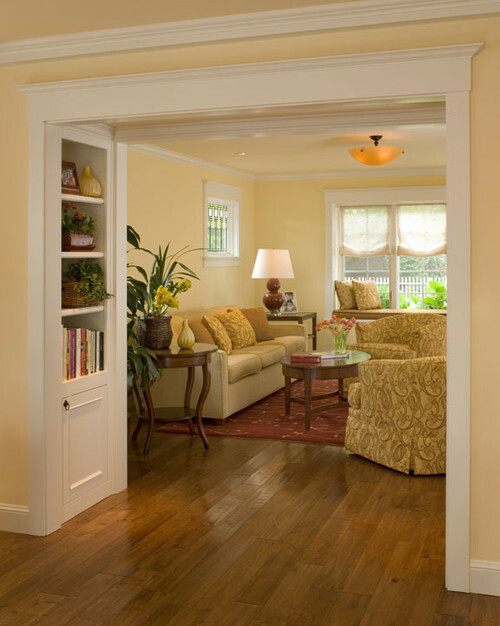 traditional living room design by san diego architect Christian Rice Architects, Inc. So of course I would love this room and lamp - it is Kate's @ The Centsational Girl. I adore her style! See again - here the proportions are correct. I do kinda like the idea of a boxy shade since the couch and chair are quite curvy. Might be an nice juxtaposition. These lamps are a little skinny but I do like the height. Since I am going to be in the corner of the room - I feel like it should be somewhat tall. Now see this I like - I have always thought those short squaty based lamps couldn't hold their own in a larger room. I would have never thought to keep the presentation tight and put a tall cylindrical shade to it. This one is a little traditional - but then I am a traditional girl. Not sure if I like that color of shade on the lamp but the overall size and height are right. 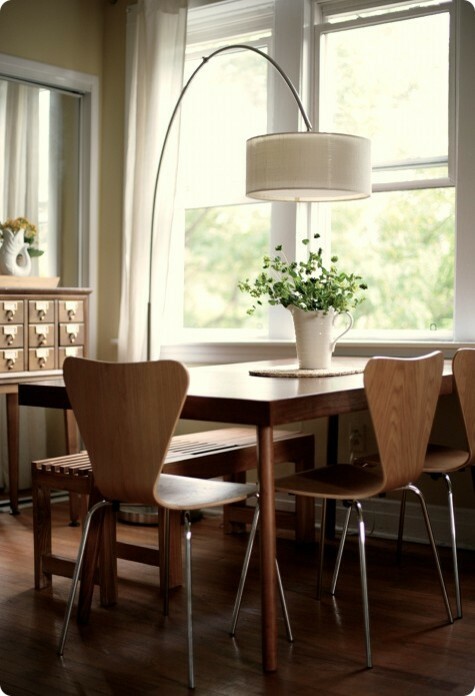 I think we already know that I have a "thing" for trimmed lampshades as I have featured them several times. These would be no exception. And I LOVE the big white base. Ok - so this might be the perfect blend of "lampness". Square shade, curvy substantial base, and a little bling? I might have found my dream lamp. P.S. That mirror is fantastic! So those are what I have found so far. Any ideas from the group? If you look at yesterday's post you can see the area I am trying to fill and what is currently there. What kind, size, style do you think would look perfect there? I am open to feedback! Linking this up to the Inspired by Party with Melissa @ The Inspired Room. Come join the fun! Ok - finally I finished getting all the fabric sample pillows done for the Living Room redo. So let's refresh our memories at what the room looked like with the blah pillows before. Yawn - boring! So here we go - check it out with my new pop of blue! So much better don't you think! I love how these bad boys came out!. The colors of my backer fabric really work well with the existing cushions. Here are some close ups of the couch pillows. And the other side! I love the very back print! I am so happy with the way it came out. But there is still more to do. Here is what is left on the list. Ah - it never ends does it. What rooms are you still working on? How much fun can you have in one day with some spray paint? Loads! I got a can of Heirloom White and transformed these yard sale and bargain bin treasures into beauties! If there is a moral to this story - it is that anything can be saved with a little spray paint. Next up - a couple of $1 frames that went from blah wood to shabby chic beauties! The bird print I got a couple of weekends ago out and about and the other was hand drawn by my cousin. My mom gave it to me for my birthday! 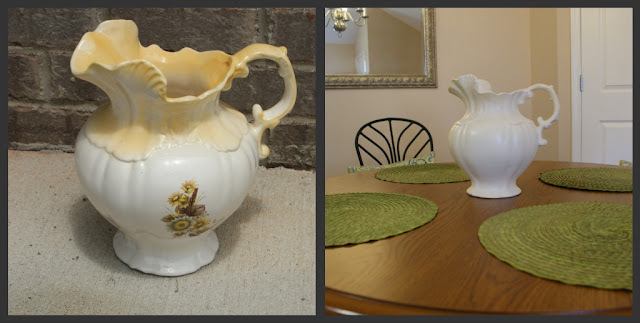 Finally - my 50 cent pitcher that I picked up this weekend looks so much better with a good coat of Heirloom White. Now it looks like an heirloom treasure! Love it! Umm - let's do a little before and after shall we? Can you say gorgeous? So those were my fun projects this weekend! What did you get into? Done any spray painting recently? Lemme know! Also linking this up to the CSI Project's Yard Sale Makeover Challenge - join the fun!